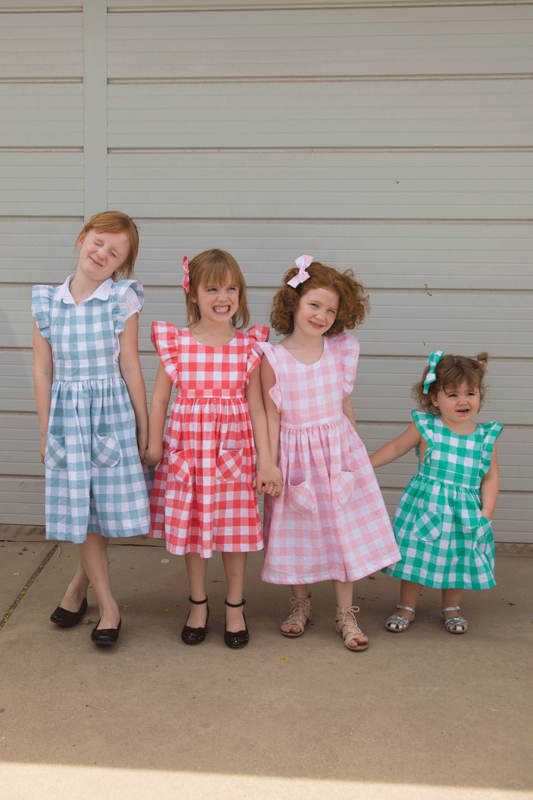 Check out the full line up of all the girls’ Easter dresses! You guys! I can’t believe I pulled it off, but I got dresses made for all my big girls in time for Sunday. It’s an Easter miracle! Of course I had planned to make a dress for baby Alice as well, and then decided it wasn’t worth the effort for something she’d wear for 3 months. The first two and a half dresses I sewed at a leisurely pace a week ahead of time..and then the last one and a half dresses I finished on Saturday. At 10pm. Because if you’re not doing things at the last possible minute, you’re not living, am I right?? I used the Infinite A-line dress pattern and hacked it into a pinafore following the instructions that I posted last week. My dress is also me made, from a couple years ago (details here). While I love fresh spring outfits and the opportunity to celebrate with family, around here we try to remember that the real reason for Easter is the resurrection of our Savior, Jesus Christ. Because of Him we can hope for a future free of pain and suffering. He’s given us hope for a life full of joy with our loved ones and because of Him, we don’t need to fear death! I can’t think of a single gift more important and life-changing than that.